Preheat oven to 350° F. Generously spray 2 (9 inch) round cake pans with non-stick baking spray. Divide batter between the cake pans. Bake for 25-30 minutes, or until cakes spring back to the touch and a toothpick inserted into the center comes out clean. Remove cakes from pans and cool completely on cooling racks. Top one cake layer with marshmallow cream. Top with second cake layer. Spread frosting in even layer on top and sides of cake. Working one section at a time, press Golden Grahams™ into frosting on sides of cake to coat. Assemble cake just before serving to avoid marshmallow cream from seeping. To assemble, place first cake layer on a serving plate. Add marshmallow cream to the top, spreading with a metal spatula or knife dipped into hot water. Add second cake layer, then frost with chocolate frosting. Press cereal into sides of cake. Get the kids to draw or write freely on the cake top, graffiti style. If children are young, they can write their names with a toothpick and you can trace over them with the cookie icing. Serve immediately with ice cream, if desired. Because the only thing better than s’mores is a giant s’more… made out of cake. What is s’mores cake? 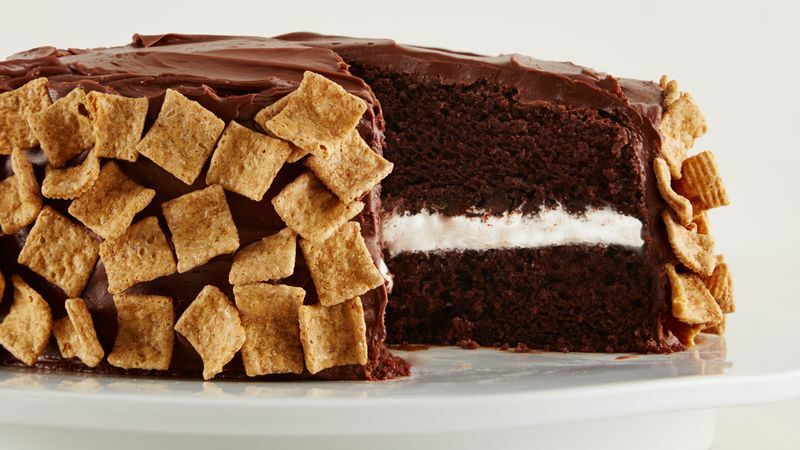 Why, it’s layers of decadent marshmallow- and chocolate-infused cake, held together with marshmallow cream, finished with rich chocolate frosting and studded with sweet graham cracker-y bits. 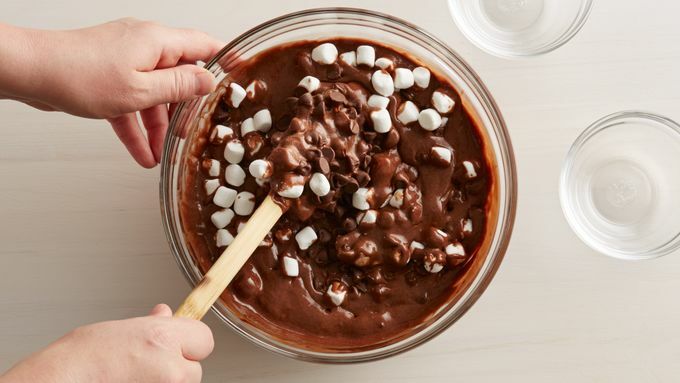 To start, prepare your cake mix using the instructions on the box, then add a cup each of mini marshmallows and chocolate chips. Bake them in round pans and remove them onto cooling racks. When they're all the way cooled down, top one layer with the entire amount of marshmallow cream and top with the second cake layer. 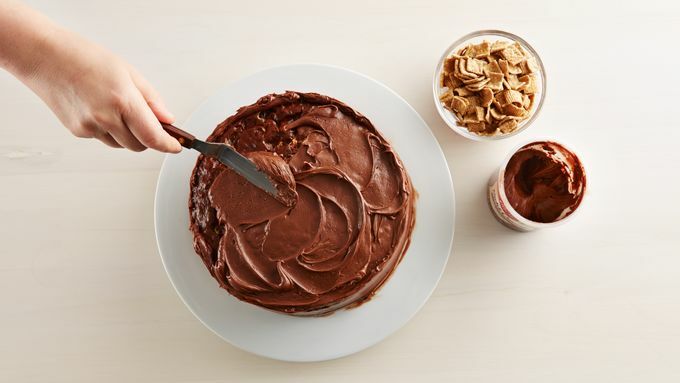 Then spread chocolate frosting over the top and sides of the cake, covering completely. 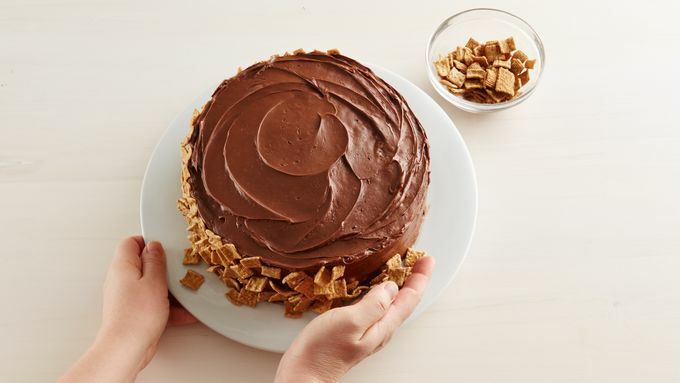 And because even a giant s’more isn’t a s’more until the graham crackers arrive, cover the sides of the cake with Golden Grahams cereal. And enjoy! No one will be able to resist the ooey-gooey greatness of this grown-up, king-sized spin on s’mores.